BlackBerry is paying homage to the Boxing Day holiday in Canada by offering discounts to its Canadian and U.S. customers. Power users are in line to save some money in each country. In the states, BlackBerry is taking $100 off the price of the black, white and red BlackBerry Passport, dropping the price to $599 for each model. Canadian shoppers can take $100 off the black and white BlackBerry Passport, bringing the price down to $599. The red variant also receives a $100 haircut, and that makes the discounted price $699. Yes, that really doesn't make any sense, even taking currency valuations into consideration. We're only the messenger, so address your questions to BlackBerry. Those in the states can take 55% off the BlackBerry Z30, picking up the 5-inch 'Berry for $225. Both white and black models are available. In Canada, the BlackBerry Z30 is 50% off at $250. Discounts are also available for various accessories. 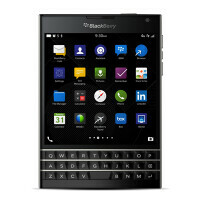 Purchases from BlackBerry's online store can be financed over six months using PayPal Credit. So if you've been looking at rewarding yourself or others with one of BlackBerry's two most capable handsets, now would be the time to make the purchase directly from the manufacturer. Don't wait too long as the sale expires on December 30th. Awesome! Nice savings, especially on the Z30. Both are great smartphones. In th USA, nothing has changed for the Passport, and the Z30 got the same Black Friday deal. These are still good deals for phenomenal smartphones. Kamal, I see BB10 is an excellent OS for the full touch screen. BlackBerry had a great chance to let BB10 has a greater marketshare . They just don't focus on the high end touch screen. I'm still seeing Thorsten Heinz had a very good view and prediction for BB10. He just did not have enough time to perform what he dreamed to have. Z10 is an awesome phone! Samantha, you really have to get over this whole thinking I'm someone named Kamal. I'm really not. Sorry to disappoint you on that. BB10 is an excellent OS, full touch screen or with physical keyboard and touch screen. In my opinion, BlackBerry should have always remained dedicated primarily to enterprise, government and regulated industries. They could have dabbled in the consumer market as a side gig, but they lost focus when they went full-on into the consumer market. Thorstein Heinz was not transparent about BB10. He did what he could, but he was still following operations set forth by Basille and Lazardis. Those two lost their way big time. John Chen stepped, saw what needed to be done, and did it. He continues to do it. He returned BlackBerry to their roots, which they should never have strayed from in the first place. Enterprise, government and regulated industries should always be BlackBerry's primary focus. They can and should use the consumer market only as a secondary option and source of revenue. And the Z10 really is an awesome phone. Agree on that point. manti.. keep your opinions to yourself, they are doing very well w/out your so called advice! its not about what you think! they are moving in the right direction! "These are still good deals for phenomenal smartphones." IMO, the prices need to come down a bit so BB gets back to having these things fly off the shelves. The LG G3 normal no contract price on Amazon has been $499 now for a while. That's the price point BB should aim for with the Passport. I still think they're good prices, nonetheless. And they're still phenomenal smartphones. To each his own. With all that's been going on lately you don't think privacy and data security are important? You must have no money, garbage credit and live with your parents. Well good on you for jumping to conclusions. "With all that's been going on lately you don't think privacy and data security are important?" Google is widely known for actively fighting against individual privacy and data security and this is the primary reason that most Android phone owners have essentially no substantial app security or data security functionality. I picked up a Z30 to play around with during the Black Friday deal and I've been impressed with the thing. The keyboard is just great and the Hub is the sort of feature that really changes how you use your device. The native app selection is a weak spot, but Android apps do a pretty good job of overcoming that issue. Outside of Google apps, I haven't encountered anything I regularly use on my Nexus 5 that I can't use on the Z30. Verizon!!!!!!!!!!!!!!!!!!!!! why are you not discounted? I would have loved to get a Z30 for $225!!!! "The red variant also receives a $100 haircut, and that makes the discounted price $699. Yes, that really doesn't make any sense, even taking currency valuations into consideration. We're only the messenger, so address your questions to BlackBerry." Hey Alan, upon my checking the BlackBerry web site, it shows that the red variant is $599 with the $100 haircut. You might want to update that in the article. Correction: The red variant in Canada is $699. In the U.S., it's $599. Canadians are paying a higher price for both devices. Go figure. The BlackBerry Classic is the greatest smartphone in the history of electronic consumer devices. Except for the TV and radio. And wireless speakers. Although that last one is debatable. Yes, I'm a little drunk. Merry Christmas! Too bad the Passport isn't available on Vz, I'm intensely curious about it. Loved BB back in the day. Xq10xa, get a life man. You've gotten enough attention, now scram.